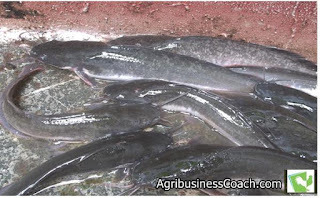 the neglect of the fundamental principle for profitable catfish or tilapia farming. If you don't carry out the correct practices for profitable fish farming, you are inviting poor growth, mortality and general investment loss in your fish farming business. Optimum water quality guarantees a high growth rate of catfish. This is because dissolved oxygen is adequate, dissolved carbon dioxide is low, pH is normal, dissolved nutrients are present at required concentrations. Poor water slows down the growth of catfish and tilapia. Take your water quality management serious. Higher quality feed and feeding the required amount of feeds results in a faster growth rate of fishes. Poor quality fries, fingerlings, or juveniles stocked will not grow well. This may be due to the poor genetic ability of the fish or poor health condition of the fish seed. Some fish species are genetically superior in growth rate than others. This could be because of a high feed conversion and disease resistance characteristics. The growth rate of fishes can be improved through breeding. Some fishes also have a poor health condition or lack of resistance to some diseases. This could be because of the broodstock used to produce the fish seeds or a hatchery error. In all, avoid bad fish seeds when stocking your ponds to avoid high fish mortality or (and) poor growth. How do you think living conditions will be when 100 persons are packed into a small bedroom? It's going to be scary😰😨. That's how fishes react when you overcrowd them. An overstocked or overpopulated fish pond is usually associated with a poor growth rate of fish. This is because of the high rate of competition for food, available oxygen, and space. In most cases, the bigger or more aggressive ones eat the weaker and smaller ones. Make sure you stock the fishes at the optimum density required for adequate growth and development. 10- over 100 per meter square for an intensive system. Stocking capacity is dependent on management practice. Most female fishes (both catfish and tilapia) convert most of their energy (consumed feed) to egg production and not flesh accumulation. Therefore, this makes them not to grow bigger compared to their male counterparts. Stocking of only male fishes (catfish and tilapia) guarantee a higher growth rate and flesh accumulation. Tilapia and catfish with a poor health condition are usually associated with poor growth rate. Poor health may be as a result of nutritional deficiency, poor water quality, overcrowding, and handling stress. This is the recommended weight your catfishes should have after some month(s). This will help you to compare if you fishes are growing well based on what is expected. Please note that the recommendations below are purely based on average results achieved from various successful fish farms. Assuming you stocked catfish juveniles of 10 grams, you should realize the following weights after specific months if you are carrying out all the best management practices. The resulting weight above can be achieved under recommended best practices in catfish farming. With good feeds that meet the nutritional requirement of your fishes, good water quality and good fish seeds, farmers should be able to get a result that falls within the range given above. What You should do to prevent poor growth and losses? 1. Identify the cause of the problem by going through the points I stated above about causes of slow fish growth. Every other problem can be corrected except poor fish seeds or runts. Feeds can be improved and given as at when due. If the water condition is poor, make adjustments to your water management practices and reduce fish density if you overstocked. 2. Never take any decision to sell before three months except they are raised for such a market. This is because some fish species grow slowly initially and pick up after the third month. 3. Feed them with the right feed and the right size at the right number of times. 4. When there is no significant improvement in your catfish growth after four months, please sell them out. The more you keep such fishes, the more you lose. Don’t ever forget that bad does not convert well no matter how they are fed. You have questions or thoughts to share? I would like to hear from you please comment using the comment box below.